This post is brought to you by Morinaga Nutritional Foods, Inc., maker of Mori-Nu® Silken Tofu and The Motherhood. All opinions are my own. When you mention tofu to most people, a complex look overcomes their face. There’s so much trepidation and confusion when it comes to tofu, most specifically on how to cook it or what kind of dishes to use it in. 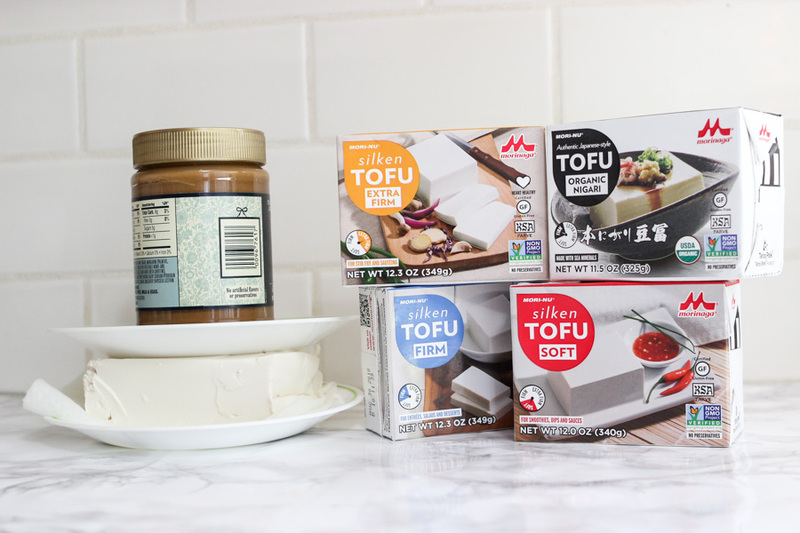 The thing is, tofu is super versatile, affordable and a great alternative protein for everyone (not just those with a plant-based vegan diet!). Tofu can be used in everything from salads, main dishes, appetizers, desserts and can even be a substitute for dairy ingredients. My first exposure to tofu was many, many years ago (almost 20 years ago) before its popularity skyrocketed in the cooking sphere. In high school I worked at a summer camp as a cook and we often used tofu in dishes. It was at this job that I had my first experience eating and cooking tofu. At that job, I was exposed to using tofu in lots of different types of recipes and the different ways that it can be cooked. One way that has always stuck with me was cooking and serving it crispy. 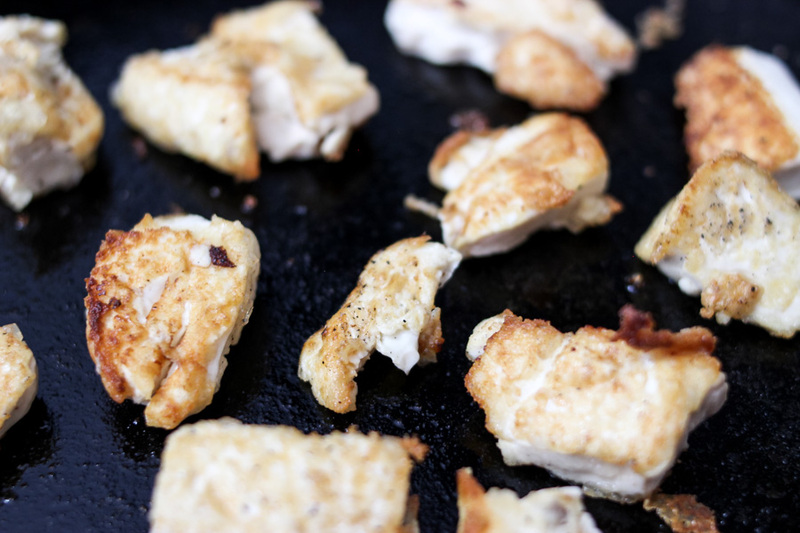 While it can be deep fried, I prefer using a pan-fried option to cut down on fat for a healthier meal. 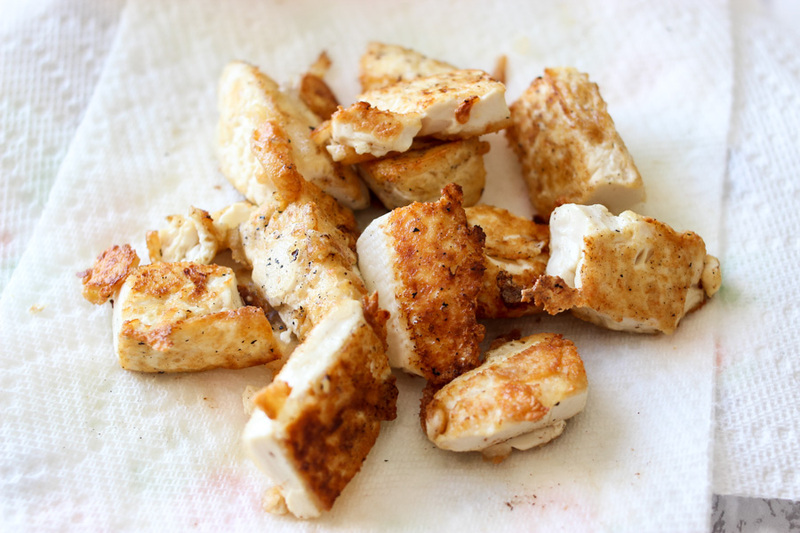 Pan frying tofu is a great option for a prepping tofu for a quick weeknight meal in a flash. When cooked properly and thoroughly, crispy tofu takes on a whole new level of yumminess. The cooking process leaves the tofu with a satisfyingly crunchy outside, meaty inside and can be packed with flavor. Crispy tofu is perfect for throwing on a salad, adding to a quinoa or rice bowl, served with dipping sauces, in pasta dishes or used in quesadillas as a perfect meat-free option. Now onto the important stuff, how to cook tofu into a delicious crispy morsel! When it comes to tofu, the most important issues to address are texture and flavor. To avoid mushy tofu, it’s super important to remove as much water as possible! When cooking crispy tofu I use Mori-Nu Silken Tofu Firm or Mori-Nu Silken Extra Firm tofu for best results. Mori-Nu Silken Tofu by Morinaga Nutritional Foods, Inc. is one of the highest quality silken tofus on the market. Some of their products are certified organic, while all of them are Kosher, non-GMO, and gluten-free. 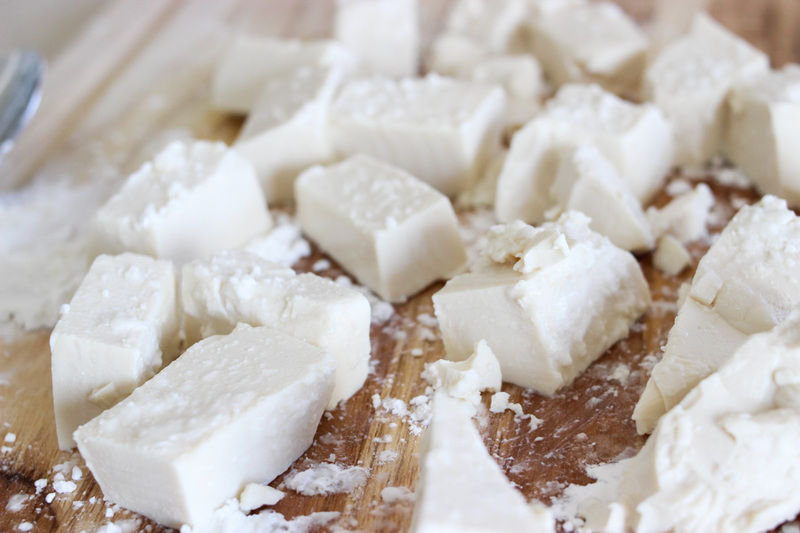 Mori-Nu Silken Tofu has a silkier and smoother texture compared to others which have a more sponge-like texture. Another bonus with Mori-Nu Silken Tofu is that it also uses a unique aseptic package that locks out light, oxygen and micro-organisms which can lead to spoilage that allows for a longer shelf-life without needing refrigeration (yay, more fridge space) or use the use of preservatives. 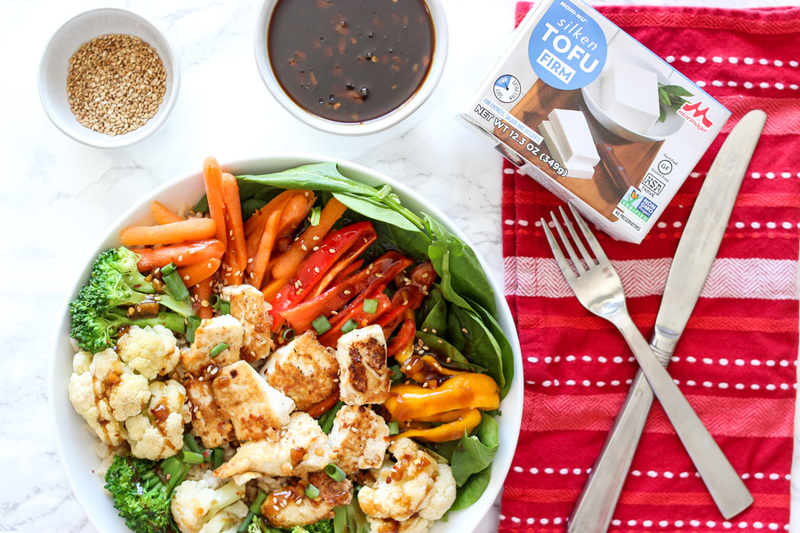 For flavor, tofu is a blank slate that pretty much takes on any flavor that you choose! 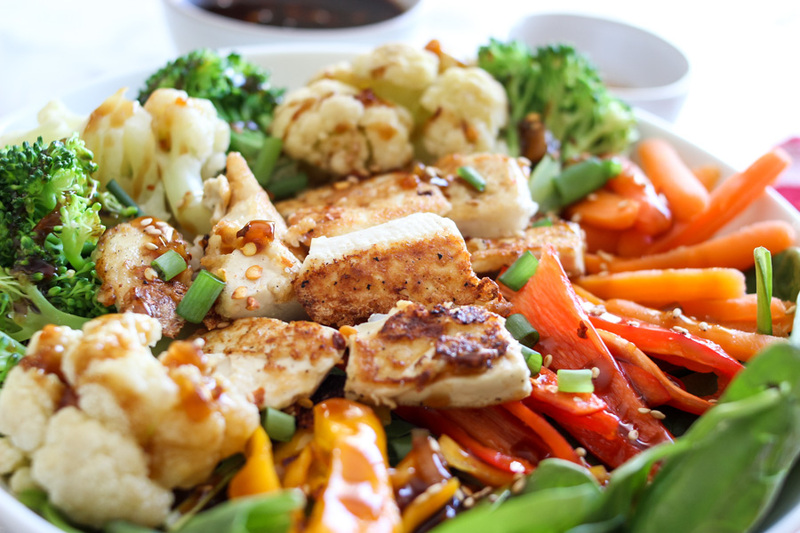 You can marinade tofu prior to cooking or simply add seasonings while cooking. To achieve the crispiest tofu it’s super important to take a little time to prep the tofu. These few steps make a world of difference for cooking a golden brown and crispy delicious tofu. Prior to cooking, you must press the tofu to help remove water. Simply remove Mori-Nu Silken Tofu from packaging, and place on a plate that has been lined with several paper towels. Set a small plate atop of the tofu and place a heavier object on top (I usually grab a pan from the pantry) and let sit for 20-30 minutes. In that time, the weight and pressure will help remove excess water from your tofu. When done pressing, pat tofu dry and cut into desired shape and size (I usually do cubes or sticks). Sprinkle tofu with seasoning of choice then sprinkle a generous amount of cornstarch over tofu to evenly coat. Heat pan (I prefer cast iron, but you can also use non-stick) over medium-high heat and add a few tablespoons of oil (I use EVOO or avocado oil). Oil should be slick and sizzle if you add water droplets to it. Having a properly hot skillet is very important to avoid tofu from sticking! Add tofu in a single layer and let cook several minutes on each side until golden brown and crispy. Transfer browned and crispy tofu to a plate lined with paper towels to cool. One of my favorite ways to enjoy crispy tofu is in an orange sauce buddha bowl! It’s such a simple dish, but the combination of flavors makes it out of this world! I simply pan fry my crispy tofu using the method above (seasoned with salt, pepper, onion and garlic powder seasonings) and add to this bowl and yummy and nutritional goodness then drizzle a spicy orange sauce on top! Mori-Nu Silken Tofu can be purchased online or in your local retail stores. 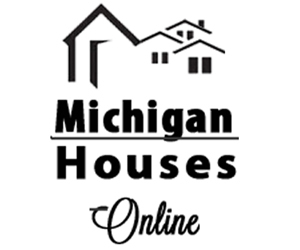 You can check using their store locator HERE to find where it is sold near you. 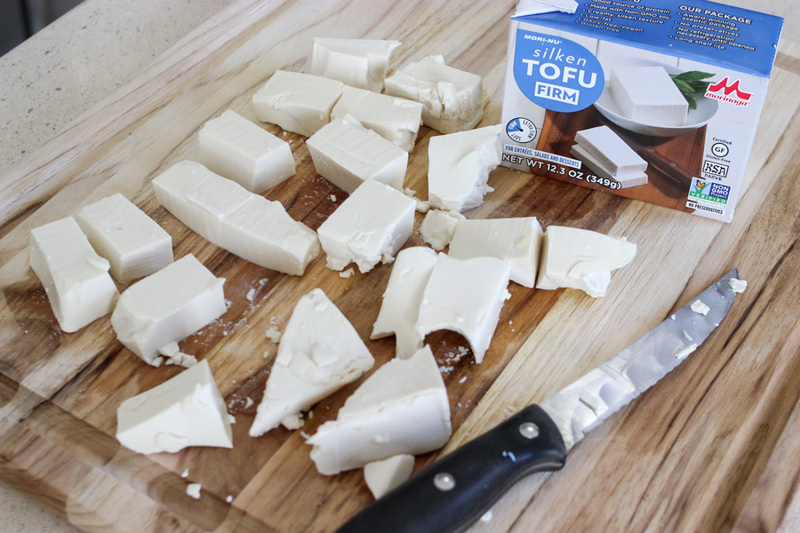 I can’t wait to try the other different varieties of Mori-Nu Silken tofu and to experiment with new ways and techniques to use tofu in meals. 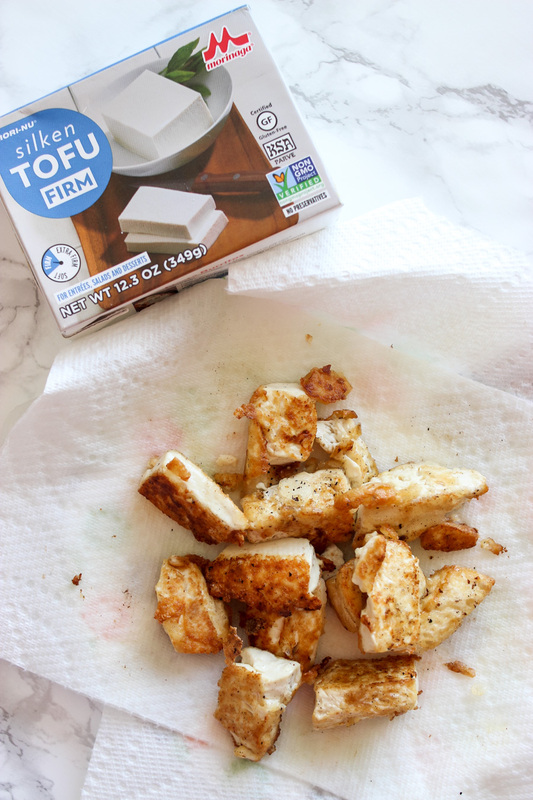 Our family has been working towards a more meatless diet and are always searching for new alternative protein options and I’m finding that tofu is a great way to supplement protein in our diet. If you have any great tofu recipes, please share them below! Do you use tofu when cooking? 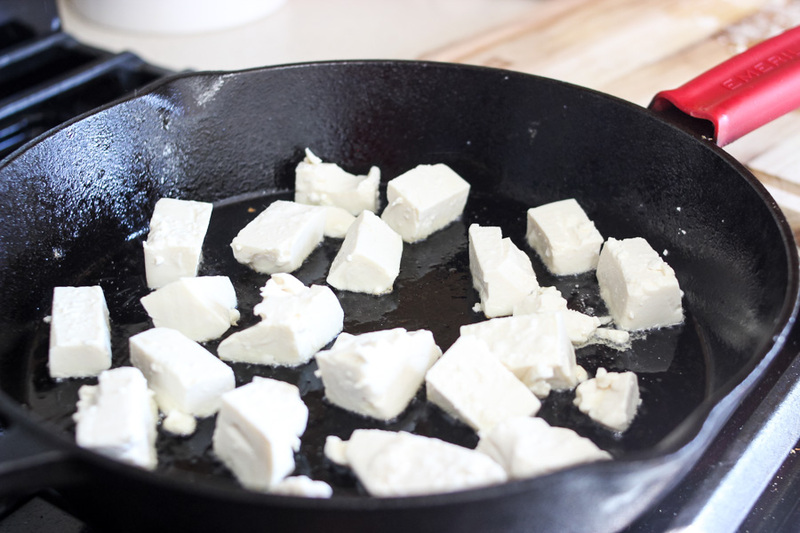 What’s your favorite way to cook tofu or recipe that uses tofu? I’ve never cooked tofu before, but after reading your post, I am inspired to try. Your Pan Fried Tofu with Orange Sauce recipe looks delicious! Mmm, this looks delicious! 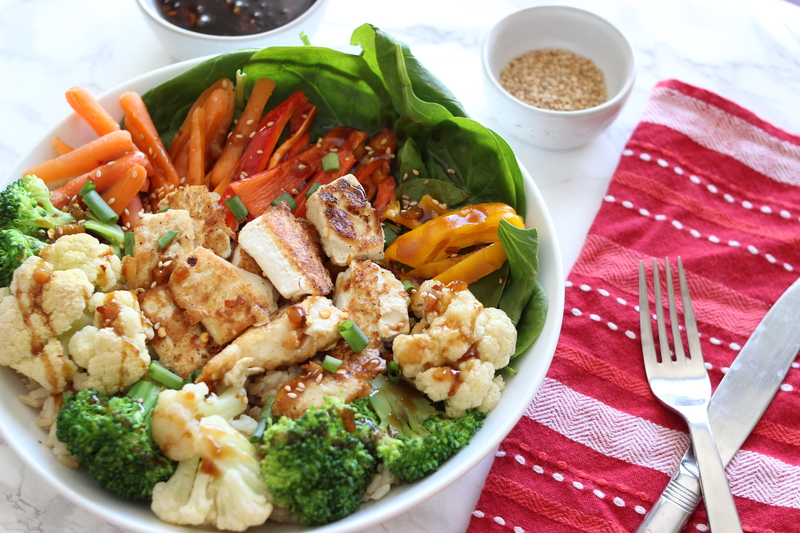 I love Buddha bowls! I love the idea that this recipe uses tofu. Such a great alternative! So I’m not a big fan of tofu, but I would eat this bowl and substitute some grilled chicken. 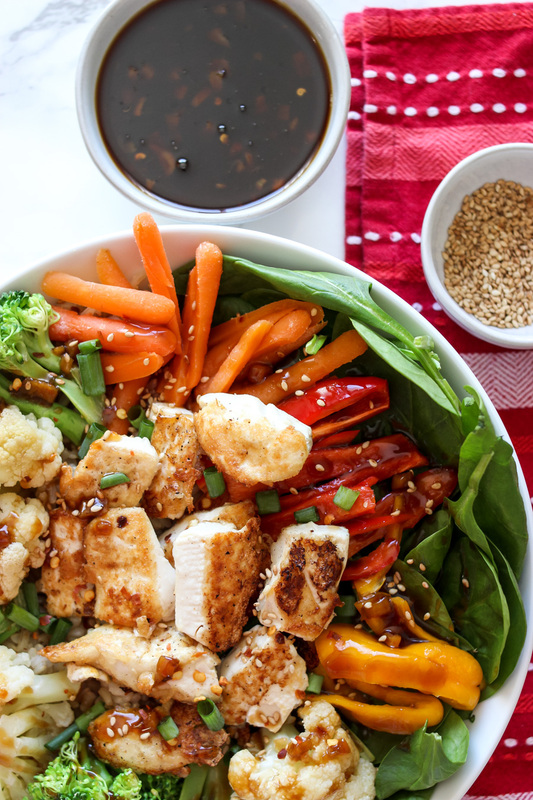 I love Buddha bowls! Sounds super tasty. Thanks for this great recipe. I have been wanting to try Tofu but didn’t even know what kind to buy. Looking forward to trying this! Awesome! I have been looking for more ways to incorporate tofu into my diet, and this recipe looks delish!